Hi, guys! I'd like to share with you one commish that I recently ordered! Grown-up version of my waifu Fam, drawn by wonderful manga-artist, in his lovely style. I'm absolutely happy with the result, so I strongly recommend him to anyone, who wants to order a commission. Reading: Mirer - "House of Wanderers"
Have a most wonderful Birthday!! You're very welcome! I really loved your unusual concepts of the WWII aircrafts. Had a couple of such ideas myself. Tell me your ideas! Prof. Veeb's always looking for new stuff! Well, one of such ideas is G4M fitted with jet engines. Aircaft-acrrier-killer that would look like a cross-breed between G4M and Ar.234. Here's a picture of it. It could carry a ramjet missle with the same radar homing as the American ASM-N-2 Bat bomb. 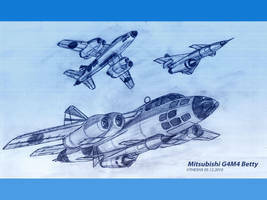 It was an idea "what if Japan had bombers with the role similar to the Soviet Tu-22M back in the WWII days." Another idea is "Post-war Hamaki in the JMSDF service in the 50-60s". With white-blue color scheme, turboprop engines, MAD boom instead of tail turret, observation domes instead of waist turrets and radome fitted into the bomb bay. I haven't comissioned this image from anyone. As always, you're very welcome. You don't have to thank me every time.